A few weeks ago we showed you how to deodorize your pads with vodka. Just in case you haven’t yet celebrated your 21st birthday, we have another method for neutralizing the smell of your hockey pads. 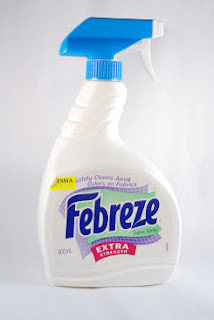 Using just three ingredients–you probably have around the house–you can make your own Febreeze. It’s probably not as effective as the real stuff, but might be worth a try. This entry was posted on on February 15, 2010 at on February 15, 2010 and is filed under diy. You can follow any responses to this entry through the RSS 2.0 feed. You can leave a response, or trackback from your own site.